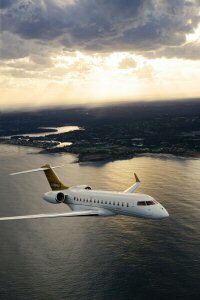 Bombardier's Global 6000 jet, featuring the Bombardier Vision flight deck, is set to make its African debut when it kicks off that continent's portion of its world tour in September, with a 16-city showcase across a total of 12 countries. It is also set to appear on the static display at South Africa's Africa Aerospace and Defence on September 19, 2012. "A particular highlight of this tour is our four day stop in Nigeria where we are seeing a growing interest in private jet travel," explained Khader Mattar, Regional Vice President, Sales, Middle East, Africa and India, Bombardier Business Aircraft. "This gives us the perfect opportunity to highlight the advantages of business aviation. We know that once our customers have experienced the Global 6000 jet, they'll truly value its importance as a tool for business. The Global 6000 aircraft offers the perfect blend of speed and cabin space to help travellers be more productive, efficient and better rested when they arrive at their destination. Coupled with its Industry-leading cockpit - the Bombardier Vision flight deck - it is unmatched in its class, once again showing that Bombardier is a true leader in business aviation." Global 6000 aircraft: The Global 6000 jet's unrivalled cabin size and levels of comfort combined with a stand-up shower and the Bombardier Vision flight deck means no other purpose built business jet comes close in terms of high-speed range capability and passenger comfort. Offering the ultimate in technology, this intrepid jet can link Lagos with Chengdu or Johannesburg and Singapore, non-stop, with eight passengers and three to four crew*. Bombardier Vision flight deck: A breakthrough in business aviation, the Bombardier Vision flight deck is designed to deliver a completely new cockpit experience. By combining the best in technological advancements with superior designer aesthetics, it provides pilots flying Bombardier's Global aircraft an unprecedented level of control and comfort. The Bombardier Vision flight deck introduces the Rockwell Collins Pro Line Fusion avionics suite, providing an integrated flight deck to ensure interoperability between systems. Pro Line Fusion for the Bombardier Vision flight deck on Global aircraft features four high-resolution 15-inch diagonal active matrix liquid crystal displays (LCD) arranged in a T-shape working in concert with the Head-up Guidance System (HGS™), personalized formats of display information, an electronic checklist, maps with graphical flight planning, an integrated cursor control panel, a Synthetic-Enhanced Vision System, paperless operation enabled by Dual Electronics Charts, a Future Air Navigation System (FANS), Controller-Pilot Datalink Communication (CPDLC), a Wide Area Augmentation System (WAAS), Localizer Performance with Vertical Guidance (LPV) and a MultiScan™ Weather Detection system. Bombardier is headquartered in Montréal, Canada. Our shares are traded on the Toronto Stock Exchange (BBD) and we are listed on the Dow Jones Sustainability World and North America indexes. In the fiscal year ended December 31, 2011, we posted revenues of $18.3 billion USD. News and information are available at www.bombardier.com or follow us on Twitter @Bombardier.